Reports of Lancastria disaster released in London after Churchill’s ban on the news lifted. Neutral French liner Meknes, taking 1,100 French sailors back to France, sunk by German E-boat 572: 400 killed. Red Cross estimates 5.5 million refugees in Vichy France. The U.S. government denounces Japanese actions in Indochina. US imposes a crude oil embargo on Japan. Nazis massacre Jewish population of Grodz, Lithuania. 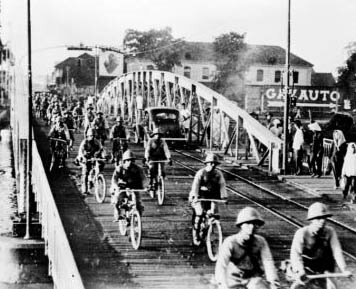 Japan begins to occupy northern French Indochina, enters Hanoi and Saigon. Roosevelt agrees with Churchill that operation ‘Gymnast’ should proceed, whilst operation ‘Sledgehammer’ should be canceled. Rostov-on-Don is captured by the 1st Panzer Army, thus clearing the way for the advance of Army Group A toward theÂ Caucasus and Kuban region. Large numbers of Russian troops are liquidated in and around Rostov after German troopsÂ have secured the city. Finland approaches the United States, seeking its protection from the Soviets should Finland switch sides and join the allies. Operation ‘Gomorrah’ takes place when 746 RAF bombers drop 2,300 tons of bombs on Hamburg in 48 minutes, duringÂ which only 12 aircraft are lost. This tonnage is as much as Germans dropped in the five heaviest raids on London. Fires are visible for 200 miles. This is the first operational use of ‘Window’, (radar-jamming foil strips droppedÂ by aircraft). A battle-damaged USAAF B-17 Flying Fortress crash-lands in Sweden. Its ten-man crew becomes the first of nearly 1,000 American and other Allied airmen to be granted refuge in neutral Sweden during World War 2. A 10-hour meeting of fascist grand council passes a motion, 19 votes to 7, asking that the King of Italy takes over command of all Italian forces from Mussolini. The U.S. submarine Tinosa fires 15 torpedoes at a lone Japanese merchant ship, none detonate. The River San is crossed by the Soviets to the northwest of Lvov. The Germans start evacuating Lvov. The Russians liberate Maidanek Concentration Camp near Lublin, where 360,000 people perished. The U.S. 4th Marine Division (15,000 men) lands on Tinian.